The NotchPeakFilter object filters each channel of the input using IIR filter implementation. Create the dsp.NotchPeakFilter object and set its properties. npFilter = dsp.NotchPeakFilter returns a second-order notching and peaking IIR filter that independently filters each channel of the input over time, using a specified center frequency and 3 dB bandwidth. npFilter = dsp.NotchPeakFilter('Specification','Quality factor and center frequency') specifies the quality factor (Q factor) of the notch or peak filter instead of the 3 dB bandwidth. npFilter = dsp.NotchPeakFilter('Specification','Coefficients') specifies the coefficient values that affect bandwidth and center frequency directly, rather than specifying the design parameters in Hz. This removes the trigonometry calculations involved when the properties are tuned. npFilter = dsp.NotchPeakFilter(Name,Value) returns a notch filter with each specified property name set to the specified value. Unspecified properties have default values. Set the specification as 'Bandwidth and center frequency', 'Quality factor and center frequency', or 'Coefficients'. Specify the filter’s 3 dB bandwidth as a finite positive numeric scalar in Hz. The value must be a scalar between 0 and half the sample rate. This property is applicable only if Specification is 'Bandwidth and center frequency'. Specify the filter’s center frequency (for both the notch and the peak) as a finite positive numeric scalar in Hz. The value must be a scalar between 0 and half the sample rate. This property is applicable only if Specification is set to 'Bandwidth and center frequency' or 'Quality factor and center frequency'. Specify the quality factor (Q factor) for both the notch and the peak filters. The Q factor is defined as the center frequency divided by the bandwidth. A higher Q factor corresponds to a narrower notch or peak. The Q factor should be a scalar value greater than 0. This property is applicable only if Specification is set to 'Quality factor and center frequency'. Specify the sample rate of the input in Hz as a finite numeric scalar. Specify the value that determines the filter’s 3 dB bandwidth as a finite numeric scalar in the range [-1 1]. The value -1 corresponds to the maximum 3 dB bandwidth (SampleRate/4), and 1 corresponds to the minimum 3 dB bandwidth (0 Hz, an allpass filter). This property is only applicable if Specification is set to 'Coefficients'. Specify the coefficient that determines the filter’s center frequency as a finite numeric scalar in the range [-1 1]. The value -1 corresponds to the minimum center frequency (0 Hz), and 1 corresponds to the maximum center frequency (SampleRate/2 Hz). The default is 0, which corresponds to SampleRate/4 Hz. Y = npFilter(x) filters each channel (column) of the input signal, x, to produce the notch filter output, Y. [Yn,Yp] = npFilter(x) filters each channel of the input signal, x, to produce the notch filter output, Yn, and peak filter output, Yp. Input signal, specified as a vector or a matrix. Notch filter output, returned as a vector or a matrix. Peak filter output, returned as a vector or a matrix. 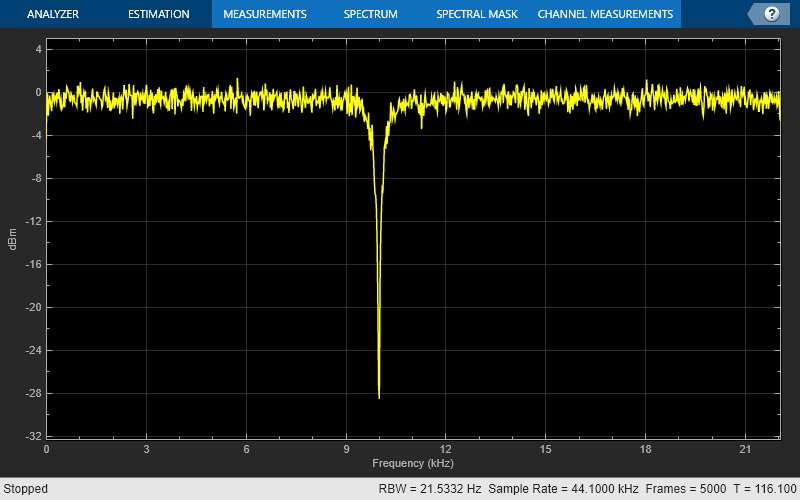 This example shows how to use dsp.NotchPeakFilter as a notch filter with center frequency of 5000 Hz and a 3 dB bandwidth of 500 Hz. Create a dsp.NotchPeakFilter object with the Specification property set to 'Quality factor and center frequency'. The default quality factor Q is 5, and the center frequency Fc is 11,025 Hz. Compute the 3 dB bandwidth of the notch peak filter using the getBandwidth function. The bandwidth is computed as the ratio of the center frequency and the quality factor, FcQ. 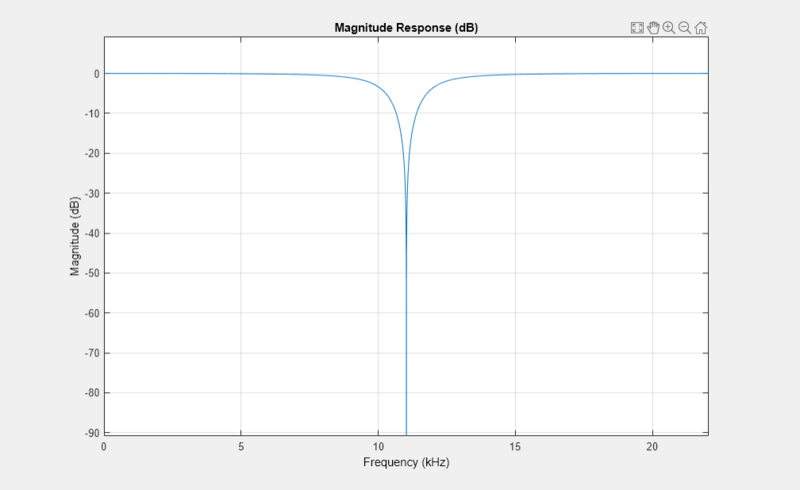 Visualize the filter response using fvtool. Create a dsp.NotchPeakFilter object with the Specification property set to 'Coefficients'. Determine the center frequency of the notch peak filter using the getCenterFrequency function. When the Specification is set to 'Coefficients', the center frequency is determined from the CenterFrequencyCoefficient value and the sample rate. Create a dsp.NotchPeakFilter object in the default configuration. Determine the octave bandwidth of the filter using the getOctaveBandwidth function. Create a dsp.NotchPeakFilter object in the default configuration, where the Specification property is set to 'Bandwidth and center frequency'. Determine the quality factor of the filter using the getQualityFactor function. The quality factor is given by the ratio of the center frequency to the bandwidth. Create a dsp.NotchPeakFilter System object™. Obtain the coefficients of the transfer function corresponding to the notch and peak filters. Bnotch and Anotch are the vectors of numerator and denominator coefficients for the equivalent transfer function corresponding to the notch filter. Bpeak and Apeak are the vectors of numerator and denominator coefficients for the equivalent transfer function corresponding to the peak filter. Notice that Gcf depends only on the center frequency, and G3dB depends only on the 3 dB bandwidth. Orfanidis, Sophocles J. Introduction to Signal Processing. Upper Saddle River, NJ: Prentice-Hall, 1996.